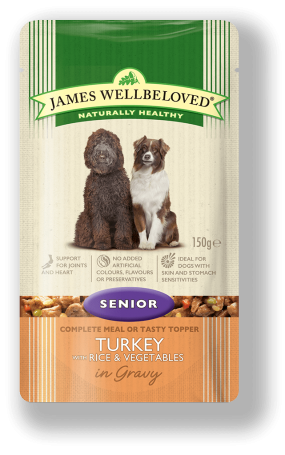 Carefully crafted and nutritionally balanced complete wet dog food for the health and wellbeing of senior dogs from 7 years. (over 10 years for small and toy) Pouch size: 150 g ALFALFA, SEAWEED AND LINSEAD to aid digestion OMEGA 3 AND OMEGA 6 FATTY ACIDS to help give a glossy, healthy coat BALANCED AMOUNT OF FUNCTIONAL FIBRES for a settled tummy and digestive system INGREDIENTS Turkey	27.5% Rice	5.6% Dried carrots	1.0% Dried peas	1.0% Sugar beet pulp	0.57% Sunflower oil	0.44% Linseed oil	0.26% Calcium carbonate	Sodium chloride	Alfalfa	Seaweed	Fish oil	0.1% Tomato powder	Glucosamine	0.01% ESSENTIAL NUTRIENTS Additives per kg: Vitamins: E671/Vitamin D3 (150 iu), 3a700/Vitamin E (28mg), E300/Vitamin C (30mg), taurine (200mg). Trace elements: E1/iron (9.9mg), E2/iodine (0.38mg), E4/copper (10mg), E5/manganese (5.4mg), E6/zinc (45mg). Analytical Constituents: moisture 81%, protein 6.0%, crude fibres 0.5%, fat content 4.0%, crude ash 1.5%.